Open from Easter to the autumn, our quiet little farm campground with 6 pitches enjoys a superb view over the valley. There is a wood-built solar-powered bathhouse with dry toilets.There is no electricity at the pitches. 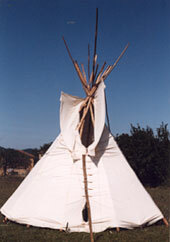 A large tipi with a maximum capacity of 6 people can be rented. 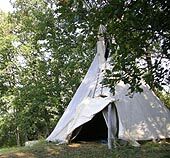 We also offer a holiday gîte sleeping 6-8 people. Family, group of 9 or more : 5 € /pers.